Foundation 1 has recently added concrete flatwork to our mix of services. 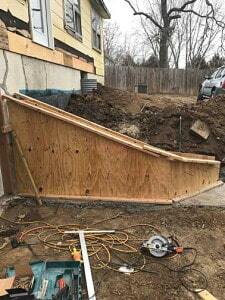 We find the two services to be extremely complementary of each other, as many foundation repair projects end of leading to the need for concrete work. Recently we had an opportunity to acquire the production equipment from Carder Concrete, a company who had been serving the KC metro (largely in the Northland) for 17 years. Steve, the owner of that company decided to change careers after experiencing some health issues. Simultaneously, we had the opportunity to hire Darrell Leathem to lead our concrete division as construction manager and estimator. Darrell has 28 years of concrete experience and has worked in a diverse number of areas from flatwork, to new home construction, to large scale commercial work, and pretty much everything else in between. Darrell brings a wealth of experience to Foundation 1 and is excited to help us expand this element of our business. 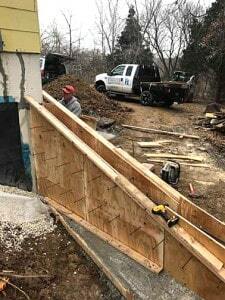 Since bringing this new service on, we have observed that about 25% of foundation repair projects also have concrete needs and we have been able to bid this work as more of a “one stop shop” for customers instead of referring out other contractors, simplifying the process for our customers. Our first project was a home which had significant foundation damage and was purchased by an investor who is rehabbing the home. In this case, the damage to the foundation was so significant that any further deterioration would have required complete demolition of the entire home. The work we did, in conjunction with our investor client, literally saved this house. With the completion of the foundation project, we recognized that adding 2 stem walls would significantly increase the stability of the foundation. The project was bid as an add on to the original project and the customer accepted. Here are some photos of the project. 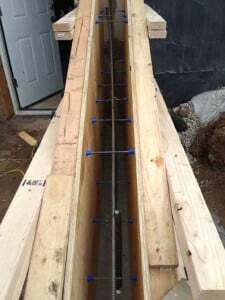 Foundation 1 is a complete foundation repair and waterproofing company including wall braces, crack repair, piering, drainage systems, sump pumps, egress windows, encapsulations, dehumidifiers, and mudjacking. The company services the entire Kansas City metro. The concrete division of the company will be able to do all kinds of flatwork, including driveways, sidewalks, porches, patios, basement floors, footings, stem walls, and retaining walls. We are also able to do decorative concrete finishes including stamping, epoxy, metallics, and antiquing. 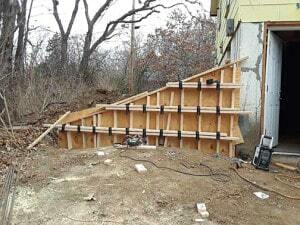 Contact Foundation 1 to get a free estimate on your foundation, waterproofing, mudjacking, and concrete need today!